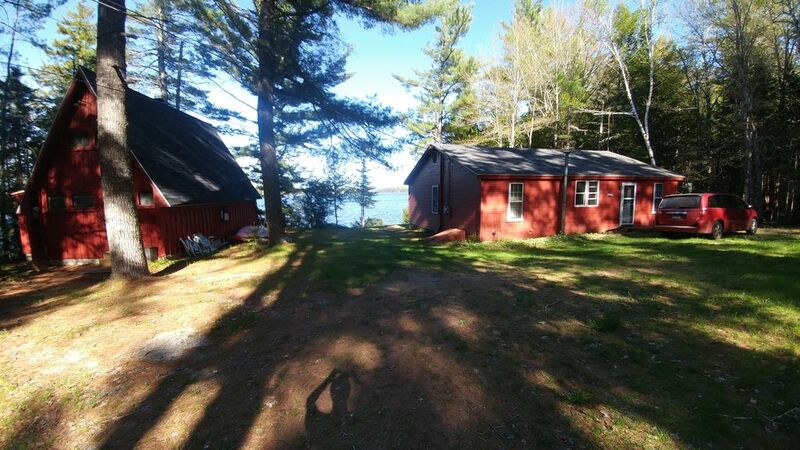 Acadia Park Region - Quiet Lakeside Cabins, Great Views! Enjoy the peaceful setting overlooking George's Pond in quiet Franklin, Maine. Only 45 minutes to Acadia National Park and Bar Harbor. Two cabins included for the price of one. Cabin one features 3 bedrooms (two full size and three twin beds), full bath, full kitchen, huge great room with wood-burning stove. Cabin two features loft sleeping area (queen and two twins), fireplace, full bath and small kitchen. Lots of open ground around the cabin for games and relaxing. Camp fire pit overlooking lake is great for star gazing on a clear night. Fish, swim or boat in the lake or simply enjoy the views. Fine dining, entertainment for the whole family, shopping, whale watching, and site-seeing are only a short distance away. Includes 3 kayaks and canoe. Have been coming to beautiful George's Pond for over 30 years. It is the best of all worlds: close to all that the Acadia Park has to offer, (both Mt Desert Island and Schoodic), quiet rural area, quiet pond in lovely setting. Two cabins for price of one. Includes three kayaks and canoe for your use. Peaceful lakefront with views across the water to small islands and mountain views. Shallow water front entry perfect for children. (2) Full kitchen in each cabin. Deck on lakeside of main cabin. Full table and benches plus second table. Fireplace in each cabin, Washer Dryer, Linens provided (not beach towels), Rental includes use of a two person Kayak, canoe. Huge deck overlooking the lake for relaxing and eating meals, Shallow water with sandy beach area is great for kids. Email for more pictures!! Pretty spot. Very quiet. Just what we were looking for. The property is perfect for a week visit. The kitchen in the main cabin is nicely equipped for anything you would need. We were happy that there was a grill for general use, as this is what we chose to do most nights. The kids loved the kayaks -- they rowed and fished to their hearts' content. We were concerned to discover the fire detector in the A frame had no battery (after we allowed our 15 and 12 year old sleep there for two nights). Not insurmountable, but definitely a bit disconcerting. Overall, a very pleasant stay! We are so glad you enjoyed your stay. The smoke detector batteries are checked/replaced every spring. We are not sure how it was missing and it will be replaced immediately. Loved it, cabins were very comfortable and homey. The location was great easy drive to Acadia, Lamoine beach, and to brewer. Dad's and kids spent many an hour on the pond kuyaking and canoing. My family and I spent a week on Georges Pond and had a great time kayaking, swimming, exploring the woods, and having nightly Smore making extravaganzas. We even ventured to Bar Harbor twice! (Highly recommended if you stay here.) While the majority of the family time was spent in the main house, my husband and I slept in the camp next door with our little guy. It was a great experience for us all. We are so glad you enjoyed your time on George's Pond. If you did not have time to get over to the Schoodic District of Acadia National Park, you should come back and check it out! We hope to see you again sometime soon! Great place to stay. Convenient to Acadia but lovely quiet peaceful place to relax. We are so glad you enjoyed your stay. Hope to have you visit us again really soon. We agree it is very relaxing but convenient to everything the Acadia region has to offer. We just came back from one week vacation in Maine. The cabins by the lake are great for our group of 12 people with little children. The lake is great for entertain. The cabins have everything we need to stay. We used washer and dryer almost everyday since the kids get themselves wet in the lake and on the beaches. It is a decent driving distance to Acadia Park. We always came to the cabins for dinner. We will definitely come back if we visit Acadia again. Limit of 8 guests including children of any age. Additional cost of $75 per guest over 8 and up to 12. No parties over 12, no exceptions.